Happy Groundhog’s day-I should watch the movie. Bill Murray used to make me laugh. We sold the truck! The man got his act together, for those who read yesterday’s post, and came to town before Greg got off of work to make sure he was able to meet with us (while on vacation from a place up North, we’re talking 6 hours from here). He wasn’t an imbecile, he was a quiet man that brought his wife…I thought was his daughter because he was twice her age but that’s my bad. It’s good timing that it sold because we found out that instead of getting a decent tax return, we might have to pay this year…we were surprised and plan to meet with someone to see if something is wrong on Greg’s W2. We were counting on that money. Goodbye to all the plans to pay off some debt and hello, poorhouse. Congratulations go out to Bill and Kim who welcomed baby William the other day! He has two great parents and therefore, everything going for him (with my calculations)…even if they are scared out of their minds right now. Cheers, you two! Last week on the New Adventures of Old Christine, her boyfriend was explaining why he loves her and it cracked me up. He said that she was the most fascinating person he’d ever met-so complicated and yet, as simple as a 4 year old and that she was like a bird that smashed into a window and then wobbles around in circles just trying to figure out how it got here…Greg was laughing (and nodding) while looking my way. I don’t eat seafood very often for the simple fact that I’ve never been that fond of that food category. Over the years I’ve grown in my tastes for crab, shrimp, scallops and a few other things. 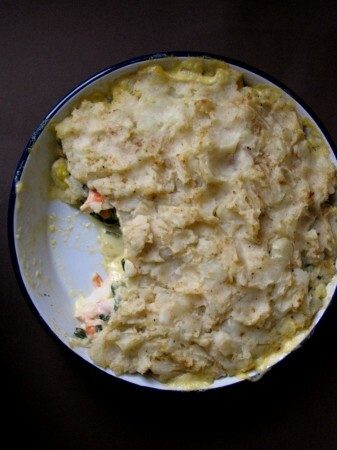 When I came across Jamie Oliver’s fantastic fish pie, I wanted to try it and Greg agreed. I changed the cod to crab meat (I couldn’t find cod of quality in our small town) and added more horseradish. I thought that it could be too creamy for our tastes and didn’t want to jeopardize this great seafood-loving journey so I put hot sauce over the top and next time, will place it within the dish. 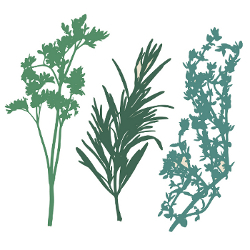 I changed a few methods and think cocktail sauce would be a great addition instead of horseradish, if you aren’t a fan of horseradish and/or mustard. I don’t recommend having leftovers-try to eat it fresh from the oven. I didn’t think the leftovers heated well but this is definitely worth a try. I usually like Jamie’s recipes, no disappointment on this one. 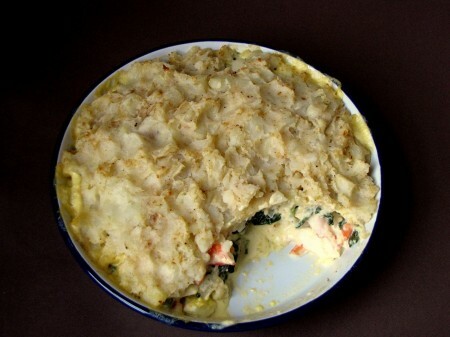 I call this recipe, since I changed it to crab, crabby shepherd’s pie. Preheat the oven to 425. Boil a pot of water with salt and add diced potatoes to boiling water for 2 minutes. Add the eggs for hardboiled (optional) eggs for 8 more minutes and remove all, drain potatoes and set eggs aside to cool. When cool, remove the shell and chop the eggs. In a pan, fry the onion and carrot in a small amount of olive oil, about 5 minutes, over med heat. Add the spinach and cook for 1 minute, then add the cream. Bring to a boil and remove from heat, add the hot sauce, cheese, lemon juice, mustard and parsley. Place the crab meat and egg pieces in an oven-safe casserole dish. Pour the cream mixture over the crab and eggs. Mash the potatoes with salt/pepper, optional nutmeg and a little olive oil and spread over the mixture to form the shepherd’s pie. Bake for 25 to 35 minutes, until potatoes are golden. Serve with more hot sauce (optional). What a great change for good old Shepherd’s Pie. i love it. Okay, I am not a fan of fish…except salmon….would that work? And coudl I use frozen salmon or should I defrost first? The rest looks AMAZING. Yeah, I believe salmon would work. I would defrost the salmon in the frig for a day and chop it into bite-sized pieces. That sounds good to me. Let me know how it goes!